Rehobot Hydraulics is specialized in manufacturing hydraulic pumps, cylinders and tools for a wide variety of applications. Hydraulic products from Rehobot are used in various industries: manufacturing, mining, aviation, (ship) building and transport. 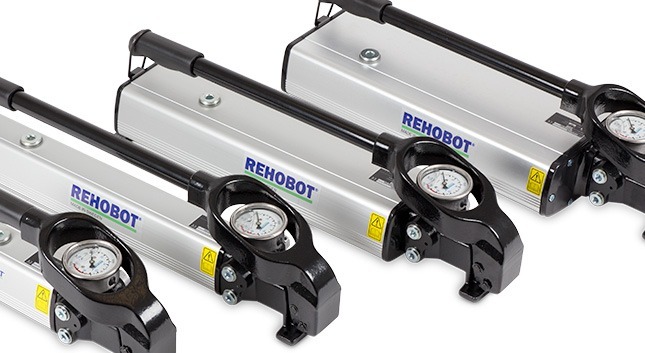 Hydraulic cylinders and pumps from Rehobot are reliable, versatile and powerful. Rehobot manufactures all sorts of hydraulic pumps in a number of designs, enabling them to provide tools for almost every field of application. Some pumps are also available as components of a complete “set”. Rehobot also manufactures products in conjunction with its customers’ specifications. If you need special pumps, cylinders or tools, then you are able to request this service in consultation with Laco. Laco offers a selection of hydraulic tools, cylinders and pumps by Rehobot for purchase or hire. WHICH REHOBOT PRODUCTS CAN YOU FIND AT LACO? Would you like to purchase or hire a hydraulic product from Rehobot? Please ask a professional Laco employee for advice. He or she will be able to help you choose the right Rehobot tool or the most appropriate cylinder for your application demands and will also advise you on accessories and system components. At Laco you can find the hydraulic tools and the flexible service you are looking for.